It’s always Mitzvah season in Portland, but this party planner wouldn’t have it any other way. Bar and Bat Mitzvahs are the milestone celebrations we have the most fun planning and the most flexibility to get creative with all the details. Our most recent Bar Mitzvah was no exception. 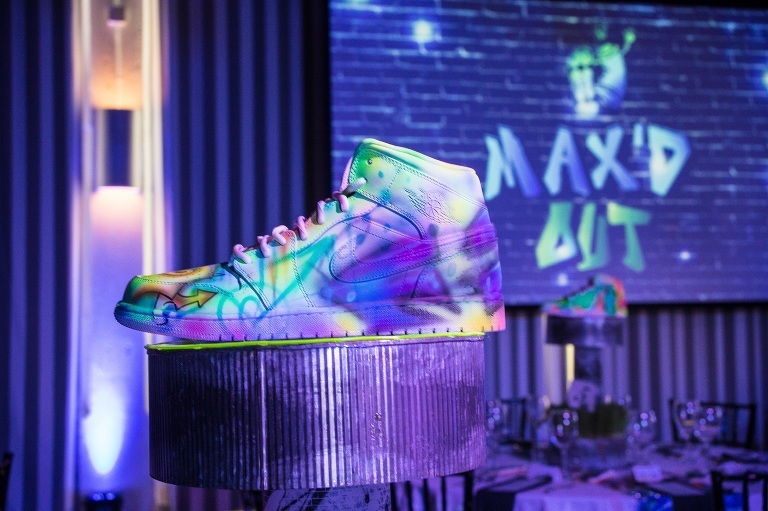 Max is something of a “sneaker head” so we took that and ran, coming up with our MAX’d Out theme, complete with spray-painted graffiti art throughout, custom Nike and Adidas shoe box tables, a glow-in-the-dark body painting station and an awesome custom slinky chandelier. We really outdid ourselves taking every aspect of this party to the max! After a successful ceremony and luncheon at Nevah Shalom, Max, his family and friends were all ready to tie one on in celebration. 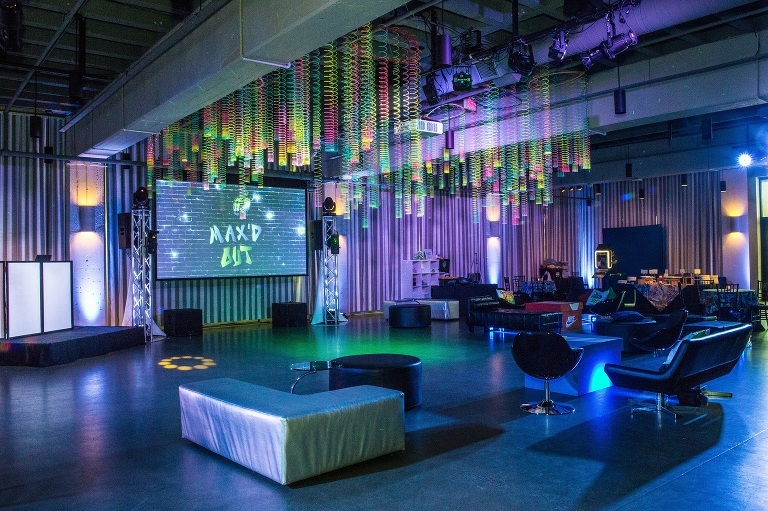 The event went down at the Exchange Ballroom in Portland where the team from Peter Corvallis and Really Big Video helped us set the club vibe with the lounge areas and giant screens featuring the Max’d Out logo. We had our talented airbrush graffiti artist, Damian Zari, prep the sneakers for our centerpieces in advance, then let him loose in the ballroom on mirrors and pillows to complete the street scene. 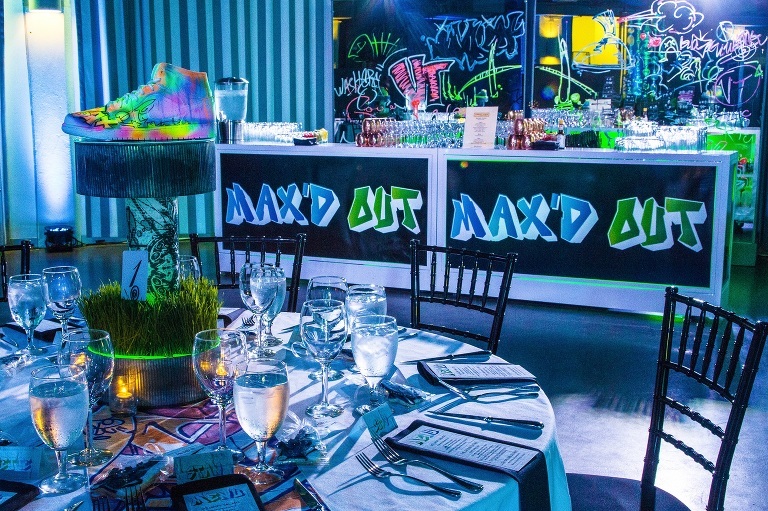 The tables were set with graffiti style runners, menus and place cards in the graffiti theme and of course, the phenomenal sneaker centerpieces. Vibrant Table catered the beyond edible grub fest then the DJ entertainment from Higher Ground kicked in to high gear taking the festivities next-level. The family didn’t want to miss a minute of the action so we had 3 different ways to capture the fun: Love and Photography for all the traditional photos, Define Motion for videography and Stumptown Photo Booth for the spontaneous memories. We had dancers and bouncers and Glow Girls, oh my! To take full advantage of the glow sticks and glow paint, we switched the room up to blacklight after dinner, a toast and Max’s Hora. The effect was fantastic and guests continued to party in the neon glow. All great parties have dessert and in Portland, dessert comes from fabulous food trucks – so we had both the Ben & Jerry’s ice cream truck, Thelma, and the Voo Doo Donuts truck set up outside to infuse the ragers with some sugar. BLC Events parties are not complete without party favors and we wanted Max’s to be useful and unique while in keeping with Portland style – umbrellas featuring the Max’d Out logo, of course! Guests of the sneaker head also took home special sneaker cookies from Sugar Shapes. Congrats, Max! Thank you for having BLC Events’ maximum efforts give you the MAX’D OUT results for your Bar Mitzvah celebration! © 2019 BLC Events|ProPhoto theme|Design + Dev by Northfolk & Co.